Amazing collection of slogans and messages for an anti bullying campaign including pictures, sayings & quotes. 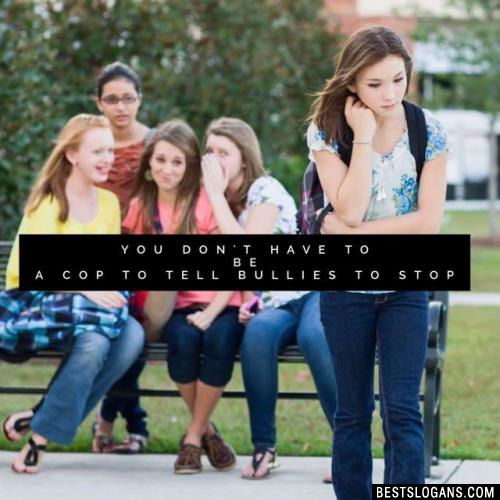 Bullying is an issue that plagues not only children and teens in school, but also adults in the workplace and everyday life. It is important to take a stand and have zero tolerance for the belittling of others. 36% of young people aged 8 to 22 are worried about being bullied at school, college or university. Those who have been bullied are more than twice as likely to have difficulty in keeping a job, or committing to saving compared to those not involved in bullying. Use the information and slogans found here to help spread awareness and make a difference in your community. You alone can make an impact and we must stand together in fighting to protect one another. 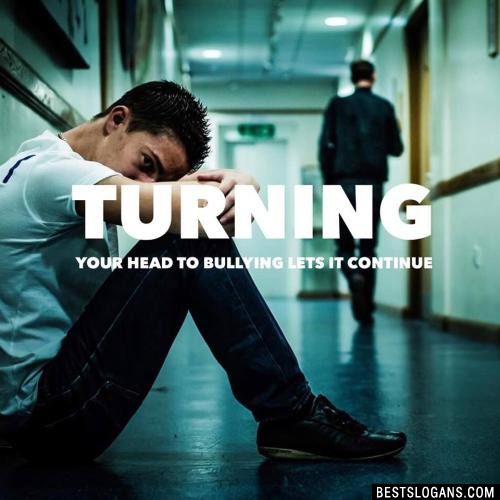 3 Use Your Brain, Being A Bully Wont Gain. 6 Take a stand. Lend a Hand. 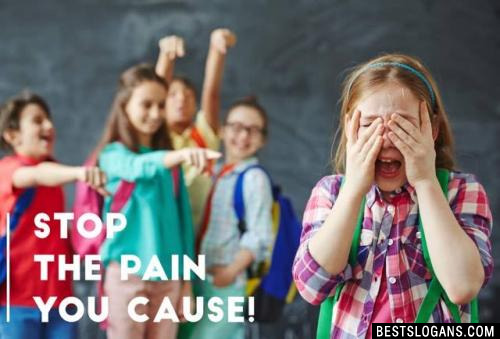 Stop the pain YOU cause! 9 Stop the Cycle of Bullying. 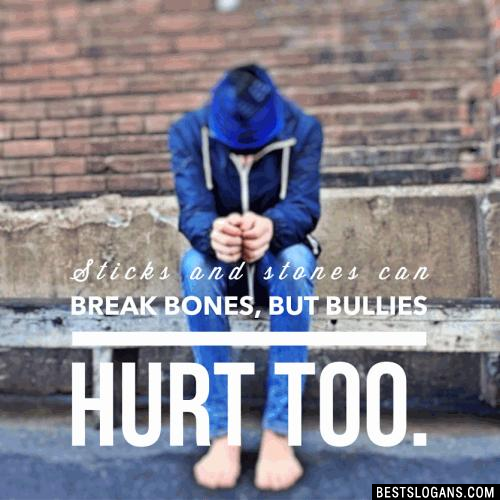 Sticks and stones can break my bones, but bullies hurt too. Some bruises are on the inside. 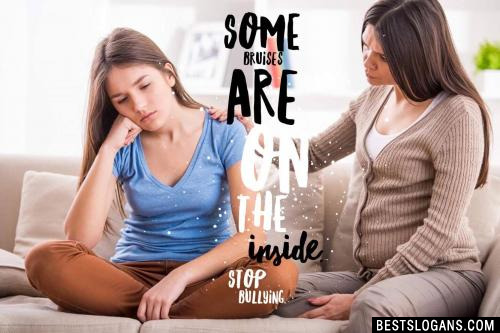 Stop bullying. Online harassment has an off-line impact. 14 Meanness is a sign of weakness! 15 Leave bullying to bulls. Become human. 16 Just Say NO to BULLYING. 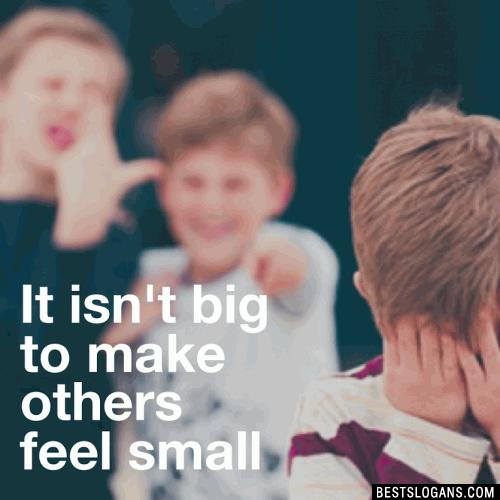 It isnt big to make make others feel small. 18 EOB End of Bullying. 19 Bullying is Whack, Get On The Right Track. 20 Bullies need to make others feel insecure because they are insecure. 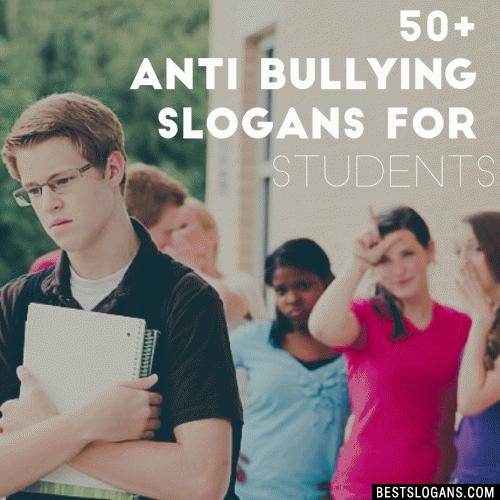 Can you think of a good Anti Bullying Slogans we're missing? Or come up with a clever one of your own. Please share below.